Salsa: if you can’t beat the heat, join it! There’s an old saying, “if you can’t beat em, join em.” It applies quite aptly to summertime heat and a good, fresh salsa don’t you think? 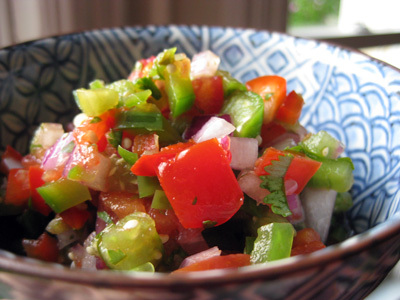 My current favorite method of salsa making is about as simple as it gets, and just relies on fresh ingredients. Just chop everything up and combine in a bowl. Serve with some tortilla chips, or toast some bread with a little olive oil for a simple bruschetta, or serve as a garnish alongside a well-seasoned and grilled flank steak. Today Lisl had some friends from her choir over for lunch, and this went over quite well (we also had a hit with a black-eyed pea salad that was sort of a combination of this and this). Below the fold, I’m attaching a few more photos from our recent trip up to the Catskills. Author GiffPosted on July 26, 2009 Categories Photography, Vegetable, VegetarianTags cilantro, photos, recipe, salsa, summer12 Comments on Salsa: if you can’t beat the heat, join it!